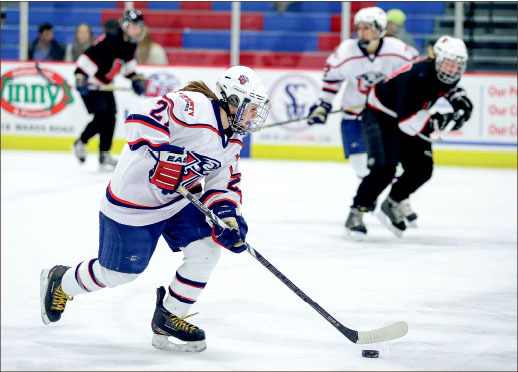 Depth was the name of the game as Liberty women’s Division I (DI) hockey team (12-8-4), who played at full strength, took down Northeastern University (11-9-1) team, which traveled only 13 players, 9-0 at the LaHaye Ice Center Saturday, Feb. 1. It was the third meeting of the season for the teams and the Lady Flames first win against the Huskies, solidifying a recent poll shift that saw Liberty assume Northeastern’s seventh place slot in American Collegiate Hockey Association (ACHA) DI rankings. The Lady Flames have suffered their share of injuries this semester, including a back problem that kept junior forward Sarah Stevenson out of the lineup since Christmas. Saturday, though, the Flames featured a full roster. The Huskies shallow lines tired quickly, while Liberty’s reserves provided valuable energy for the game. Sophomore forward Carrie Jickling, who put up two goals on the night, agreed with her coach, acknowledging endurance as a factor in the win. The Flames played a decent first period, going up 2-0 on the Huskies. It was in the final two periods that the team really came alive, however. They rushed the Northeastern net to put up four in the second and three more in the third. The shots were snuck in off the backhand, put top shelf and fired from distance in blistering slap shots, wearing out the Huskies backup goalie. “I felt like the second and third period our girls played really well, and we adjusted our game to what was going on (on the ice) and were able to capitalize on it,” Bloomfield said. Bloomfield also acknowledged goalie Kristina Toppazzini’s shutout performance, as she stopped all 22 of the Huskies shots on the night. The victory was made a bit sweeter, as it came on senior night — a special treat for graduating seniors Courtney Fischer and Nikki McCombe. With just seven games left in the regular season, the Lady Flames look forward to continuing to capitalize on their healthy status and climb the rankings as much as possible to secure a solid playoff spot. The Lady Flames picked up right where they left off the night before, as they beat the Huskies 10-1 Sunday, Feb. 2 at the LaHaye Ice Center. Freshman forward Courtney Gilmour started the scoring for the Lady Flames early in the first period, and freshman forward Marissa Graham also scored two-thirds of her hat trick in the first 20 minutes. Their goals gave the Lady Flames a 3-0 lead at the end of the first period. The Lady Flames extended their lead to 7-0 in the second period behind goals from Jickling, Fischer, Stevenson and Jenny MacArthur. The Huskies finally got on the board with 1:14 remaining in the second period after defenseman Mackenzie Boedicker deflected in a shot from the point for a power-play goal to cut the deficit to 7-1. Jickling added her second goal of the game on a shorthanded breakaway to extend the Lady Flames lead to 8-1. The Lady Flames will next be in action Friday, Feb. 7 at 10 p.m. against the Davenport University Panthers at the LaHaye Ice Center.